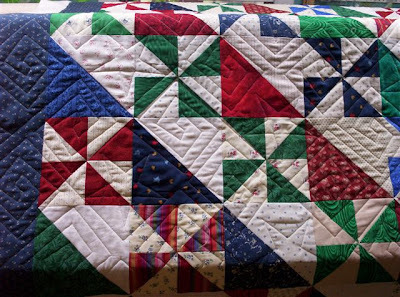 The following quilt was pieced by Deb Girton of PA. 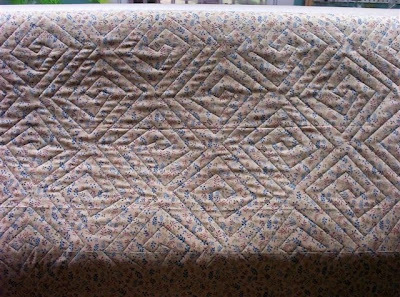 It was quilted by Georgene Huggett of VA.
"Deb sold this quilt shortly after she got it back and added the binding, so she was thrilled. She said they (quilt shop ladies I presume) all LOVED the quilting design and how it showed up so well on the back." 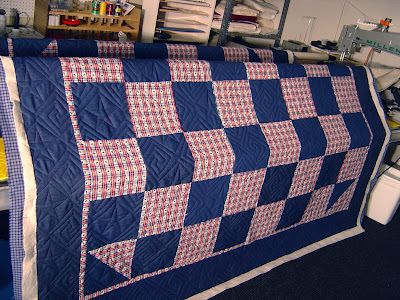 First Customer Quilt Using "Square Dance"
Circle Lord templates may be used for sewing without restriction . without permission for machine quilting templates. The Quilt above was done by Bob Lyon - on and off the machine in 2 hours. It's 68 inches by 80 inches. He does not have a stitch regulator and it was the first time he used the template. 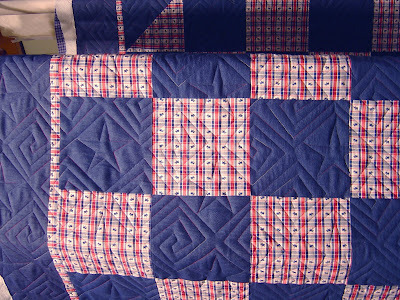 Below is a denim checker board quilt pieced by Silvana Morassutti for her grandson. 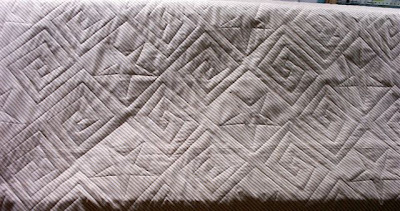 It was quilted by Kay. but with stars in every third block. 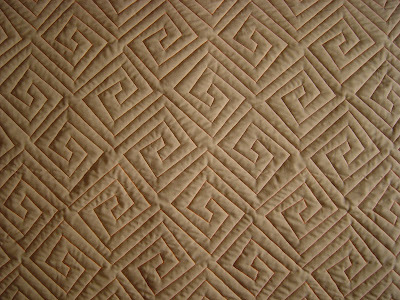 If you don't quilt the stars, you can free-hand in the space left. Or, make a panto of a something that could fit there, then place a copy on each empty space. Lift the stylus, do the panto, and then continue with the Stripes section. Here's a look at the template. It's 44 inches long and 13 inches high.The pattern is under 12 inches. It can be used on both, mid-arm and long-arm, machines. The star is 5 inches across. 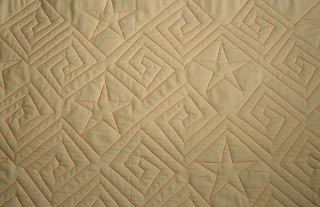 When using the stars, the quilting is continuous - no trailing threads. 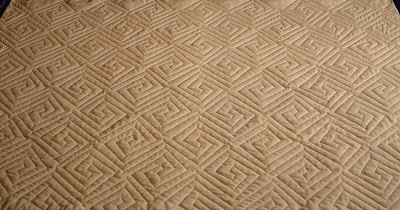 And, here's the quilted pattern. It is recommended that you use King size on a 12-14 foot table. and a Queen on a 10 foot table. You don't save money, or time, moving a short template. Circle Lord template designs are copyright protected by Loricles. 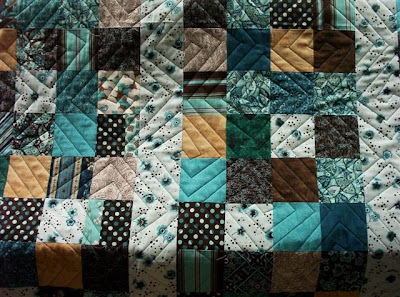 These designs may be quilted by the owner of the template without restriction. 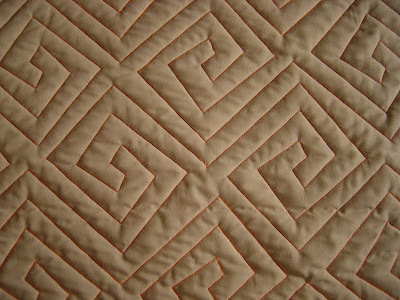 These designs may not be produced on either computer quilting programs, or any material used for grooved template manufacture.